HNRNP L antibody recognizes heterogeneous nuclear ribonucleoprotein l. This antibody has been extensively validated for western blotting using whole cell lysates. Mouse anti Human hnRNP L antibody recognizes the heterogeneous nuclear ribonucleoprotein L (hnRNP L). Heterogeneous nuclear RNAs (hnRNAs) which include mRNA precursors and mature mRNAs are associated with specific proteins to form heterogenous ribonucleoprotein (hnRNP) complexes. Heterogeneous nuclear ribonucleoprotein L is among the proteins that are stably associated with hnRNP complexes and along with other hnRNP proteins is likely to play a major role in the formation, packaging, processing, and function of mRNA. This protein is present in the nucleoplasm as part of the hnRNP complex but hnRNP proteins have also been identified outside of the nucleoplasm. Exchange of hnRNP for mRNA-binding proteins accompanies transport of mRNA from the nucleus to the cytoplasm. Since hnRNP proteins have been shown to shuttle between the nucleus and the cytoplasm, it is possible that they also have cytoplasmic functions. Two transcript variants encoding different isoforms have been found for HNRNPL (provided by RefSeq, Jul 2008). 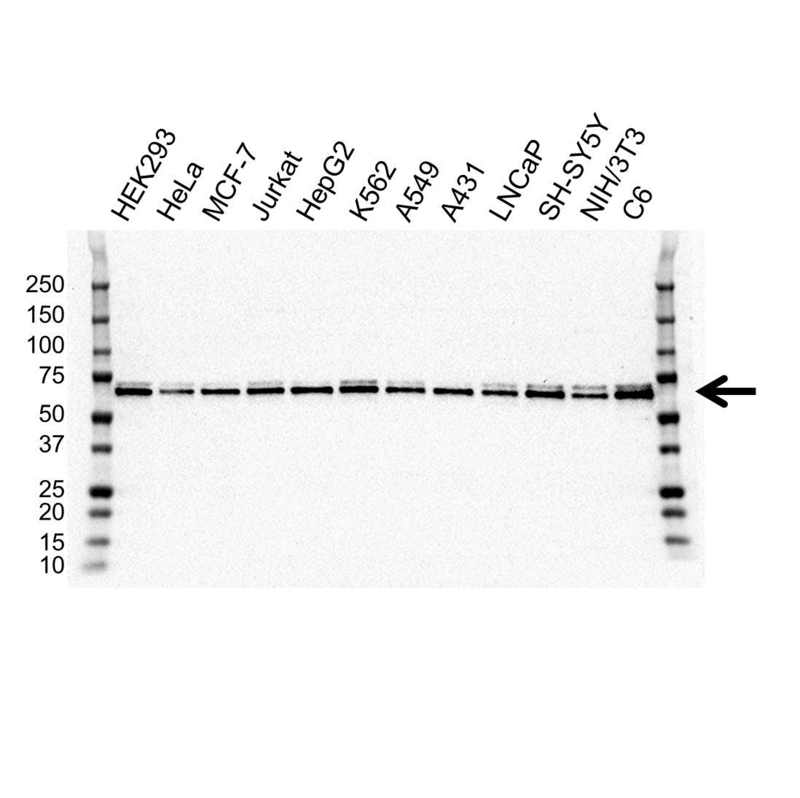 Mouse anti Human hnRNP L antibody detects a band of 64 kDa. The antibody has been extensively validated for western blotting using whole cell lysates.